The Red Sox Foundation invites local residents to vote for their favorite non-profit in the the fourth annual “IMPACT” Awards. 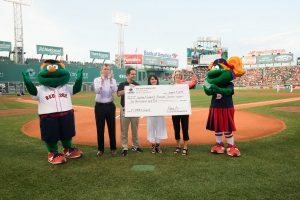 The awards provide Red Sox fans in the five New England states surrounding Massachusetts with the opportunity to vote to decide which organizations will be awarded grants. Starting this year, the IMPACT Awards will highlight a different charitable mission each year, with 2018 focusing on non-profits dedicated to improving social justice, diversity, and inclusion in New England communities. The Foundation will donate a total of $75,000 in total to fifteen non-profits, with votes determining a first, second, and third place winner in each of the five states. First place winners will receive a $10,000 award and check presentation during a pregame ceremony at Fenway Park, tickets to a game, recognition on the team and foundation websites, and air time to promote their charity during a game in the NESN broadcast booth. Charities with the second and third most votes will receive grants of $3,000 and $2,000 respectively, along with additional benefits. To be eligible to receive an IMPACT award, an organization must be a recognized 501(c)(3) non-profit public charity in good standing, located in New England and servicing New England residents, with a mission that focuses on improving diversity, inclusivity, and social justice in our New England communities. IMPACT Award voting for all five states starts today on redsox.com/impact. The voting deadline for Vermont and Rhodes Island is June 27. The deadline for New Hampshire, Maine, and Connecticut is July 13.